no pictures, sorry. 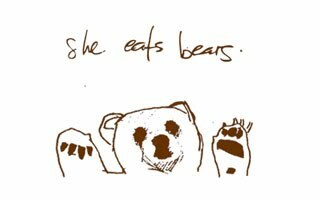 they all were eaten. 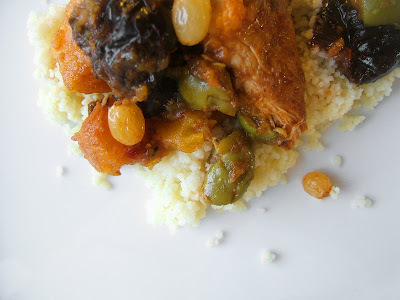 Couscous is a favorite here, we eat a lot of it in summer, simple salads with fresh ingredients. In the fall, it becomes more of a base for stews, saucy presentations. This was a very simple dish to prepare, it took me only a couple minutes even though I had a whole chicken to put into pieces. I used the white meat as well as the legs that I deboned. The rest of the chicken was roasted and put into a stock overnight. Season the chicken pieces with salt and pepper, put in a hot pan with oil and cook until golden on both sides. 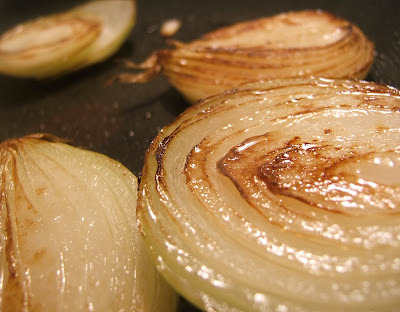 Add onion pieces and stir with a spoon. Add the white wine, garlic, spices. Let simmer until reduced by half. Add all other ingredients, put lid on and let simmer gently. This was perfect served on couscous with wilted garlic&lemon Swiss Chard. As Simon would say: home sweet home. It's been awhile since I have had an evening home, as in: not arriving from work past 7-8pm, then eating horribly late. I haven't eaten a proper dinner at home since... hmmmm... last Tuesday? I have been alone a few nights, so that equals a veggie platter, roasted kale and cheese + crackers. Then, I ate at work. Delicious, but I eat in a corner way too late, way too fast. And last night I had a delightful dinner with friends at Absinthe as part of the Omnivore Supper Club. I bought this rack of pork thinking I would cook it Saturday or Sunday, then it dawned on me that I would be at work in the evenings. blaaaah. One good thing came out of this though, it got to absorb delicious flavors in the past few days. 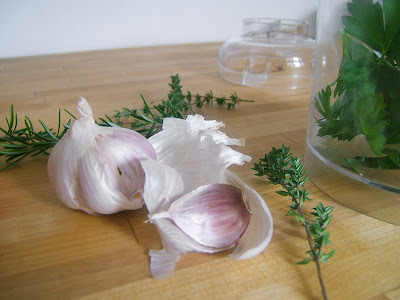 We got garlic in the CSA basket from Juniper Farm and, believe it or not, my herbs are still growing like mad in the garden. Behold the thyme, rosemary and parsley. 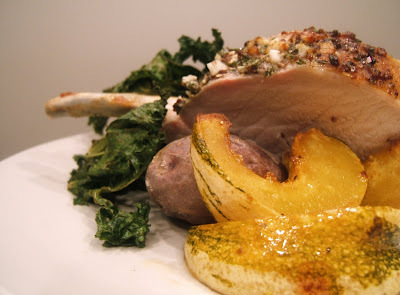 We ate the pork with oven roasted kale (Amy! Kale! Kale! ), purple potatoes and squash from Juniper. The squash was so tender, we even ate the skin - it was roasted it with maple syrup & cayenne. I made these with my basic muffin recipe and did a few substitutions. For one, no pecans but rather hazelnuts. I love hazelnuts. I love them so much that I was up late last night cracking them open because I had none that were shelled. The second substitution is the yoghurt. I had goat's milk. 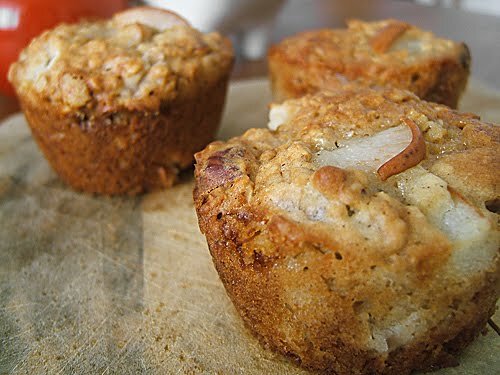 I love the combination of pear and goat cheese, so why not try it in a muffin? Last but not least, I had no more brown sugar. I replaced with a combination of palm sugar and honey. Oh! And I had no more orange juice, but replace with sweet apple cider. 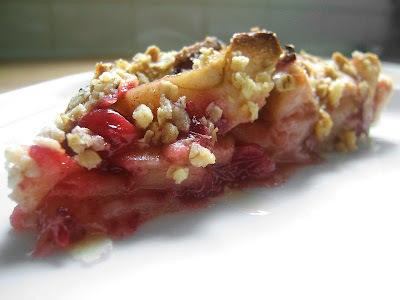 I was craving this pie. We had to pick up a storage unit for prints and large drawings today, and the lady selling it to us was 8 months pregnant and craving sweets - so I did a small one for her as well. 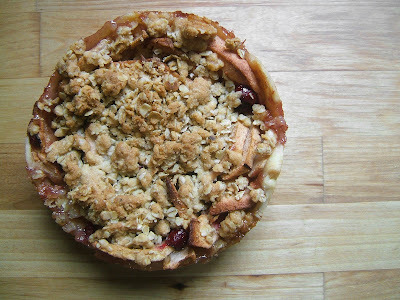 Mix the ingredients with your fingers and crumble on top of the pie, cook for 35 minutes or until golden. I am pretty neurotic when it comes to wine. The sommelier who taught the first wine class I ever attended told us to always buy more than you can drink. Store it. Enjoy it when it is at its peak. Simon must have thought I was mad when he met me... I had all these bottles with tiny little stickers on them. Price, sometimes ideal year to open. And no, you cannot pick whatever, whenever. I open older or more expensive bottles only on special occasions. New job, good contract, big painting sold, father died... and Friday, I just needed to be cheered up. We sat on the floor and went through the bottles, trying to pick what would go best with what we were about to prepare. The meal in itself was not so special (although very very good! ), but I needed a treat. 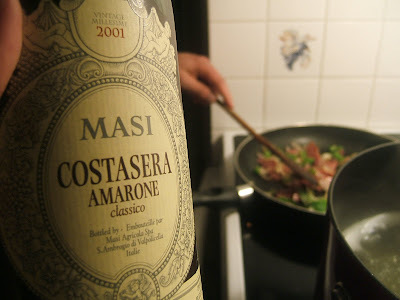 Who would have guessed that a good bottle of wine can prevent a girl from crying or getting really really mad? 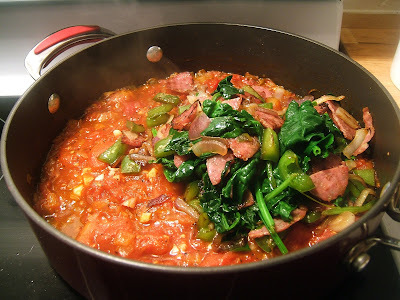 We enjoyed it with pasta, a simple spicy tomato sauce with red wine salami, spinach and green peppers. -Never EVER go to Café Bacci. We had gift certificates and were going to a show right next to it, so we thought, heh, why not. Worst. Meal. Ever. Gross from a-z, even the antipasti platter was sad. The cheapest possible cheeses, with 4 tiny pieces of factory bread, 4-5 olives, commercial spicy eggplant for an astronomical price. Simon's pasta was so bad we couldn't even pinpoint what 'the bad' was. My Carbonara seemed to have been done by a 15 year old who poured cream on ham chunks. -Last night we had a very chill evening with a group of friends: all were to dress in green, bring green food as part of a buffet. Projections of trees, fake grass on the concrete floor, and soft green lighting... Isn't it fun to do something out of the ordinary? -Tonight, ta-ta-tâ!!!!! Dinner at Simon's parent. A quick hour with them, then we both get back to work on our projects. these are my all time favourite. 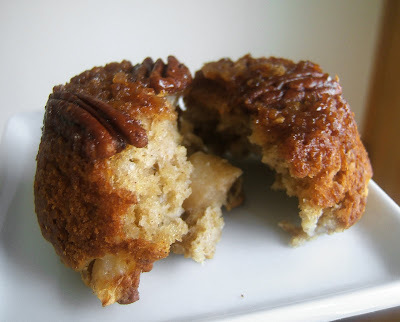 the muffin dough is not to sweet... so you don't feel bad eating the yummy caramelly pecans on the bottom. I used to do these every morning when I worked in Chelsea. One thing I find comforting about restaurant work is routine. Although I do have a job now that I love, but is fit for someone with ADD, I miss the mental checklists, doing things in order that they should, the satisfaction of all food being out, done, over and out. Being alone in a kitchen is calming, at least I found it to be. I made muffins, and scones, and pies, cakes and soup. every. single. day. variations on the same theme stimulates creativity and develops palate - i find people are often all over the place trying out too many dishes, when they should be perfecting a few, then going on to the next challenge. These muffins you can vary, just keep the base, change the nuts and spices. I prepare the wet mix, the dry and the sugar-butter the night before. Mix equal parts brown sugar and soft butter. You should need no more than 1 cup total. As a guide, I mix in a cup! 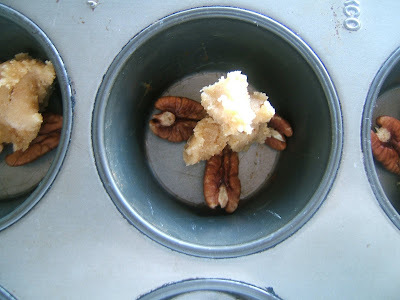 Put 3 pecans on the bottom of each muffin mould, then scoop some sugar butter. Preheat your oven to 350. 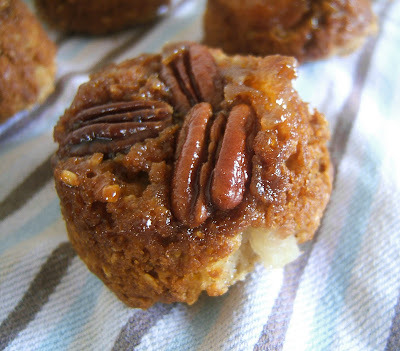 Start by putting your muffin pan in the oven with the pecans and sugar butter. Leave it for 5 minutes or until bubbling. Meanwhile, mix the wet ingredients into the dry ingredients, do not overmix. Take the muffin pan out carefully (hot butter!!!) and scoop the muffin mix into the muffin tins. You should have exactly enough for 12 small muffins or 6 big. 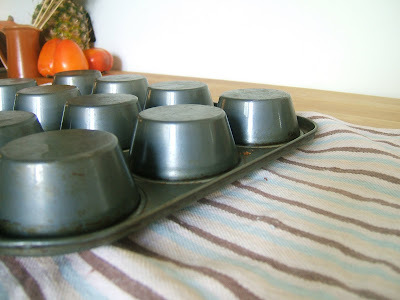 Have a clean kitchen towel ready to inverse the muffin pan. As the muffins come out of the oven, cut around each one with a knife to ensure that they will come out easily. Inverse the pan on the kitchen towel, turning the mould away from you (not to splatter yourself, that is not a fun way to start your morning...). You need to do this step as soon as the muffins are out of the oven for the caramel to remain gooey and slide out of the pan. i've had an odd past few days, i had a horrible headache, just like a bad cold, but no runny nose, no sore throat. i was dizzy and felt like throwing up. i slept and slept. yesterday i went to sleep as soon as i came back from work, woke up, went back to sleep, i wanted to bash my head in. then, by some kind of miracle, i found the energy to get up and do what i had wanted to do for a few days...soft, gooey mac and cheese. Hey kids, I finally went to the grocery store! 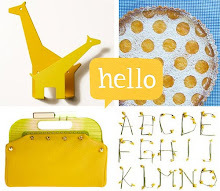 I think it has been 3 weeks since I actually took a big shopping cart to go around a store... Yay! I made time and forced Simon to come with me. I usually stay away from meat at the grocery store, even more from meat that is on sale, but I couldn't resist this huge chunk of beef today. The roast was so big that we cut it in half and saved for a next time. 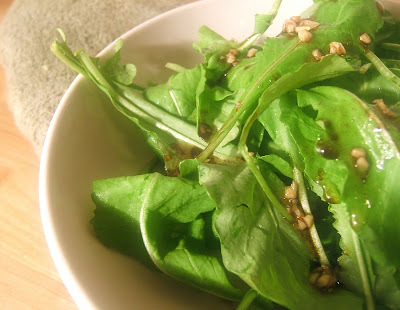 We started dinner with arugula from our CSA fall share. always yummy. Sear the beef in a pan or creuset style pot. (I have major hesitation using the creuset cocotte on my glass-ceramic stove top... I need to read up a bit more on that.) Remove to a plate. Add the garlic cloves, smashed, turn around in the pot a bit, then deglaze with the red wine. Add the shallots, let reduce. Add the roast back in, or transfer it all to an oven safe dish of not using a cocotte. Pour in the stock, add the herbs and pepper to taste. Cook for at least 2.5 hours at 300F. (I think mine cooked for 3.5 hours) Add the veggies in order of cooking time - I like to add my carrots before all the rest as it gives a nice flavor. Then potatoes, then parsnips and rutabaga. i left my camera at work, so it is a phone picture tonight. c) there was a hunting gun leaning on our patio door. so here is a picture of the food. just the food. 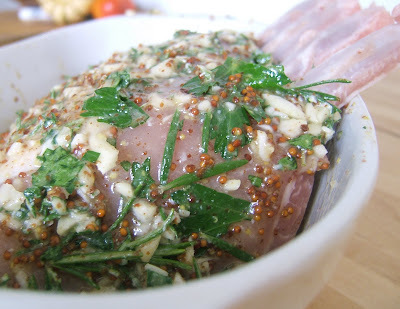 i rolled the pork loin with bread crumbs, garlic, rosemary, grainy mustard and dijon. the flaky thing was delicious: i pan roasted some onions, butternut squash, then added garlic, pecans, cinnamon, chili flakes, balsamic vinegar. 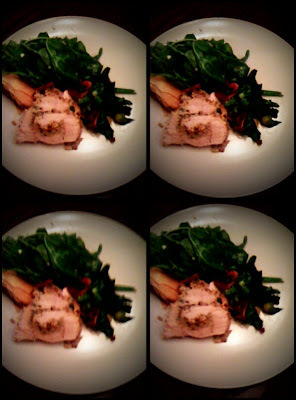 we also had a nice arugula salad with an orange-grainy mustard dressing & roasted brussels sprouts, spinach and bacon. I know the take out number by heart. Tonight, I made some at home. We were set out to make Pad Thai and discovered that we were out of tamarind... We weren't disappointed for long. We had no meat, so I roasted some chestnuts and tofu. I am very fond of tofu. I am very fond of veggies, and nuts, and fruit and I just can't understand why I am not vegetarian. I guess I love food, no discrimination. 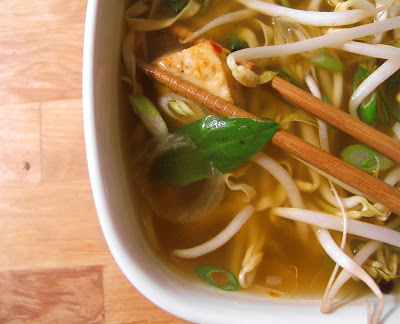 for garnish: noodles (we had fresh egg noodles), roasted chestnuts, roasted tofu (I smothered mine in soy sauce, bird's eye chili and garlic, cooked it at 400 for 20 minutes), bean sprouts, sliced green onions, lime wedges, siracha sauce, thai basil. 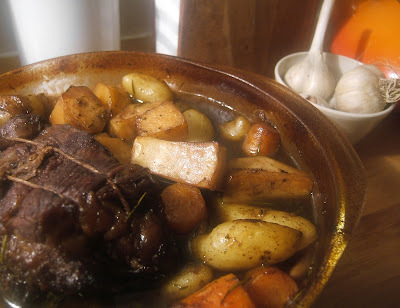 -Roast the cloves, star anise and coriander in a small pan until fragrant. Add to the stock and set to simmer. Add the lemongrass, garlic and ginger. Simmer for 20 minutes. Add sugar, fish sauce, shallots - adjust seasoning to taste. Enjoy with garnishes!! 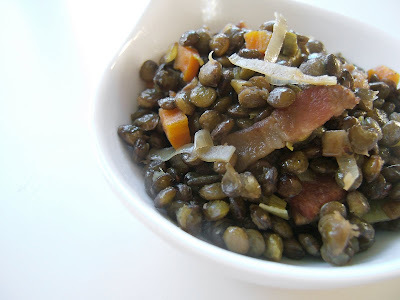 We don't eat lentils much so I thought I would make an effort this month. I often incorporate red lentils in soups, I like them even when they are mushy, a bit shy to admit. But as a side, I like them firm. 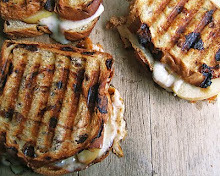 We ate them last night with some butterflied pork chops & root veg. 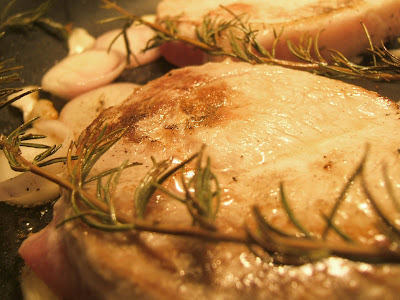 The chops I seared, then cooked with shallots, smashed garlic, rosemary. Put those in the oven, deglazed the pan with white wine, reduced, and added some butter. For the root veg, I started off by pan roasting some sliced onions, then added these to a mix of baby potatoes, butternut squash, tiny carrots and beets. I love beets. 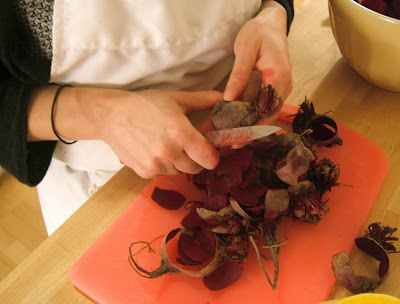 I love peeling beets. See. No gloves, I still have red hands this morning. The lentils were great. Well, I love anything with bacon... Proof? I ate the leftover for breakfast. Cook the sliced bacon for about 6-7 minutes on medium heat. Add the leeks and cook until just beginning to soften. Add the carrot and garlic, cook until leeks are tender. Set aside - do not rinse out the pot! Put the rinsed lentils into pot, add just about 3 cups of water - set on medium heat for a soft boil. Cook until al dente, remove and rinse. Put back in your pot, add wine and chicken stock, cook for about 5 minutes. Add bacon-leek mixture when liquid is almost all absorbed. Serve warm.